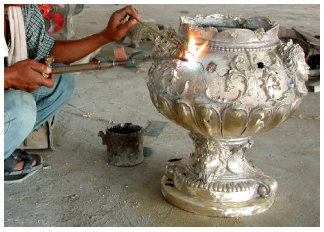 Lost Wax Casting Process Most detailed are cast using the “Lost Wax” process. This is the most precise metal casting technique in existence, ensuring accurate reproductions of the original sculpture and exquisite detail. All bronze pieces are cast from a wax model regardless of the original material the model was sculpted in usually in clay or wax. 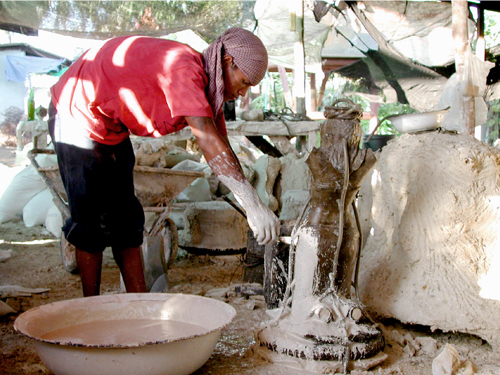 “Lost wax” casting method was found in thousand years ago. Even though, modern methods and materials have improved the technique. It is still an extremely labor intensive and expensive process. This step is the most critical. 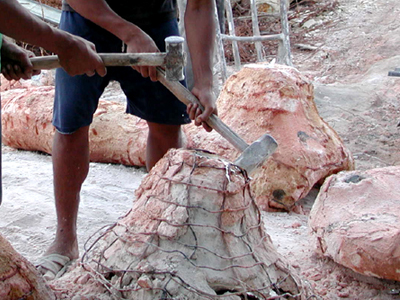 The mold is cut into sections for casting, depending on the size and design of the sculpture. All detail of the original must be captured and transferred in the mold, if not, it will be difficult to replace the detail in any other steps. We create rubber mold by covering the original with a layer silicone or latex. When the rubber is completely set, we make fiberglass or resin shell, called “Mother Mold”, in order to support the rubber for the wax pouring process. Fiberglass mold is durable and light. Now, it is ready to receive the wax. After the wax has completely cooled, the rubber mold is pulled away from the wax. Wax casting will have some imperfections such as seam lines or bubbles. Then wax duplicate is to be repaired and finished to the sculpture’s specifications. Using a variety of tools and hot soldering irons, mold lines will be removed and any parts reattached. The wax is will look exactly like the original work. First layer of wax is applied by painting into the rubber mold to capture fine detail. The mold is put together and more hot wax is poured in. It is then rotated until wax is achieved a thickness of 1/8 to 3/8 of an inch all over the mold.Then, the excess wax is poured out. Wax rods, called “gates” or “sprues”, are attached to critical points on the piece and the entire gated piece is affixed to a central wax “cup”. 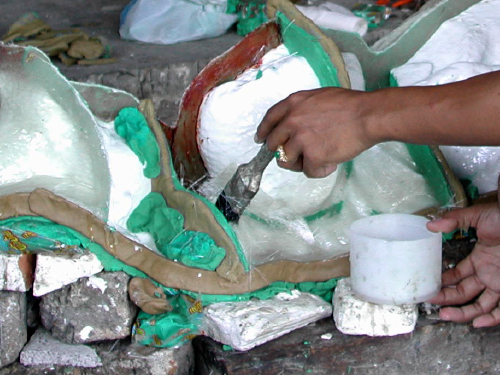 Prior to creating a ceramic shell, vents are attached within the wax model. These vents are necessary in difficult areas where gas may accumulate such as hips, limbs, and neck. When the wax is “lost”, these gates will become the avenues for the molten metal to flow into the piece. The vents allow the gas to escape when the molten bronze is poured and will prevent air pockets from forming and exploding the ceramic shell. 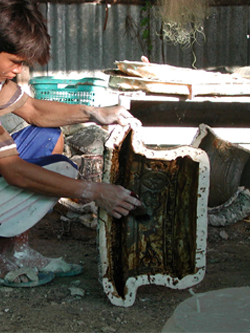 The Plaster shell is one of the few materials that can withstand the heat of molten bronze. 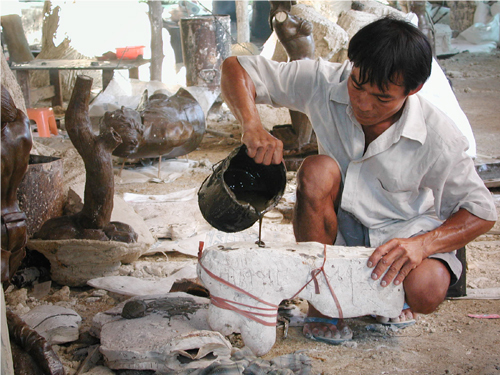 The wax casting is dipped into the powder plaster sand. 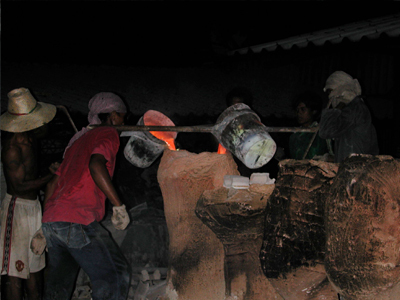 After this first layer, several layers will be applied, called “Investment Casting”. This repeated step increases the coarseness of the material to create the shell. Between each dip, the layer must dry before another layer can be applied. The shell is placed up side down in fired. The shell bakes and the wax is melted from the shell (“Lost wax”). This creates a hollow shell mold. 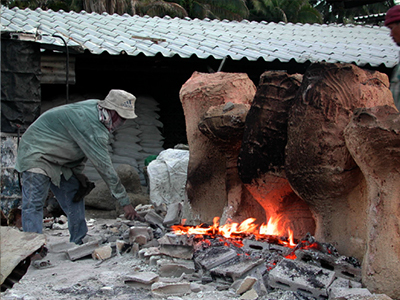 The shell is removed from the fire and immediately the molten bronze is poured into the shell. 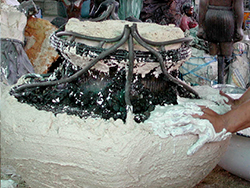 After the casting has cooled several hours, the shell will be carefully removed with hammer. 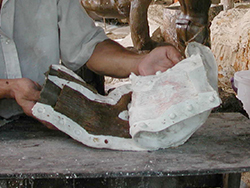 The shell is chipped off and a rough casting is removed. Spures will be cut off and extensive sand blasting will be performed in order to weld it all back together. Reassemble will take place in the welding area by carefully realigning and refitting the pieces. The bronze must now be repaired and finished. All the weld marks are chased and re-detailed to transforms the rough casting into a finished work of art. Any imperfections such as air pockets or pits must be brazed with bronze rod, as in welding. The raw bronze sculpture is now hand polished in preparation for the “Patina”. The natural bronze has a dull finish. Since bronze comes in a variety of alloys, the patina requires different chemicals and techniques to achieve variety color and look. Chemicals, pigments, heat, and a lot of experience are involved. Next a coating of wax is applied to the surface while it is hot in order to ensure durability of color and finish. This serves to protect the surface from oxidation and also gives the finished bronze its luster. Copyright © 2016 ​THAIBRONZE All rights reserved.